often having skin infections that are slow to heal. See your GP if you are worried you might have diabetes. How will my GP diagnose diabetes? Your GP will ask you if you have any symptoms of diabetes, and will discuss your family history, overall health, and lifestyle. If it's possible that you might have diabetes, or be at risk of getting it, you will need to have some blood tests. The main test for diabetes is called the HbA1c test, which measures the amount of sugar in your blood over the past two to three months. 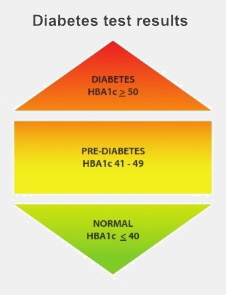 It will show whether you are in the normal range, the range for prediabetes, or the range for diabetes. The diagram on the right shows what these are. Diabetes UK has more information about the HbA1c test. It is sometimes just called the diabetes test. There are some conditions, including pregnancy and some blood disorders, when it is more accurate to use what is called a glucose tolerance test. This test measures your blood glucose after you have fasted overnight (which means not eating or drinking anything except water). You will then have a special sweet drink, followed by another blood glucose test after two hours. If the results show you have prediabetes, or other risk factors for type 2 diabetes, your general practice team will offer advice about staying healthy and what you can do to reduce your chance of getting type 2 diabetes. Your GP or practice nurse will let you know when you need another test. People are often advised to have another test every six to 12 months. information on eating well with diabetes. After this appointment, you might need to have a follow-up appointment with your doctor or practice nurse, or you might be referred to see a specialist at the Diabetes Centre. The Diabetes Centre runs some education classes that you might be interested in attending. Your general practice team, and possibly the Christchurch Hospital Diabetes Centre team, will help you manage your diabetes and any treatment you need.